Waste not, want not. While these may not be words Sister Antoine Murphy utters verbatim, they certainly seem to reflect a philosophy she holds near and dear to her heart. And with Earth Day upon us, this seems as good a time as any to reflect on that philosophy and hear the good Sister's thoughts and her longer view of green living. Sister Antoine, of the Sisters of St. Francis, has lived and worked at Saint Marys Hospital for more than 70 years. During that time, she's seen many changes. One thing that remains constant, however, is that she continues to be inspired by the teachings of St. Francis when it comes to caring for our planet. "Preserving nature is living the life of Francis," says Sister Antoine. St. Francis was such a good steward of the Earth that in 1979, Pope John Paul II named him the patron saint of "those who promote ecology and environmentalism." 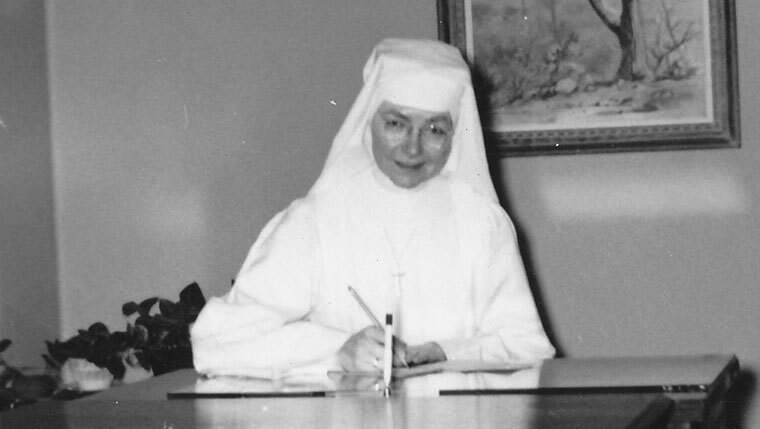 Sister Antoine employed his principles in her work at Saint Marys and encouraged others to do the same. "We currently live in a throw-away age," says Sister Antoine. "I cringe when I see waste." Over the years, she has advised her fellow sisters and nurses in training to "take the time to think about what you are using. Everything that enters the patients' rooms can’t be reused, so take the time to plan ahead and think about if you are really going to use it. This saves the patients money and is easier on the environment." Turn off lights when you leave a room. "This small action has a big impact," she says. Be more careful of your use of linens. "The piles of laundry today add to use of water, detergent and time," she says. "In the early days, we would change the bed clothes every other day when the patient was having a bath, and even then we used the top sheet as the new bottom sheet, cutting linen use in half." Serve food portions according the patient need. "An 80-pound woman can’t eat as much as 200-pound man," she says. "We served smaller portions, put on the tray by the nurse. It's healthier and doesn't waste food. It's more appetizing, and the patient can ask for more." There is one practice from the early years that Sister Antoine didn't mind seeing abandoned. No more recycling of surgical gauze. "All surgical gauze was sent to the laundry to be washed and sterilized and then brought to the sisters who stretched it on a board with nails so it could be used for hot compresses," she says. We're thankful for her advice but also relieved that not everything needs to be recycled. Recycle your thoughts on this story with a comment below.